The 2011 recommendations of the Global initiative for chronic Obstructive Lung Disease (GOLD) constituted a major paradigm shift in COPD management since they set 2 major goals for the assessment and management of patients: (1) the reduction of their current level of symptoms (i.e., treat the patient today); and (2) the reduction of their risk of exacerbations (i.e., prevent them tomorrow). Exacerbations are not only an important clinical endpoint in patients with COPD, but they are also a risk factor themselves for additional adverse outcomes since they have been shown to increase the risk for mortality, to accelerate the decline in pulmonary function, and to decrease health status and quality of life. Despite their importance, many unanswered questions related to exacerbations remain. The purpose of this review is to discuss: (1) knowns and unknowns in our current understanding of exacerbations, (2) what known factors increase their risk, and (3) how to best prevent them. Despite their importance, many questions related to COPD exacerbations remain unanswered. The purpose of this paper is to review the current state of the art with respect to prevention of COPD exacerbations. Specifically, it discusses: (1) knowns and unknowns in our current understanding of COPD exacerbations, (2) factors that increase their risk, and (3) how to prevent them. It does not discuss the adequacy of the treatment of these episodes1,19 which has been the subject of recent research. 20,21 It is important to note, however, that this is not a systematic review of the literature and basically reflects the opinions of the authors. According to GOLD “an exacerbation of COPD is an acute event characterized by a worsening of the patient’s respiratory symptoms that is beyond normal day-to-day variations and leads to a change in medication.”1 This definition is straightforward, yet it has several caveats that deserve discussion. First, it is entirely based on the perception by the patient of an increase in symptoms, which is known to vary significantly among individuals. It is entirely possible, therefore, that different patients may have different perception thresholds. This has been well established in patients with asthma22,23 but has been much less investigated in COPD. In support of this possibility is the fact that the use of diary cards to monitor COPD patients at home has shown that they may experience increases in symptoms that are indistinguishable from those occurring during exacerbations that receive treatment but are not reported/treated; so-called unreported exacerbations.14,24 Alternatively, poor family and social support may result in some patients reporting more episodes of symptom deterioration than they would have otherwise. These 2 examples illustrate the poor specificity and the unknown reproducibility of the currently accepted definition of an exacerbation of COPD. Given that this definition is used in many clinical trials, it is likely that exacerbation rates in trials are generally under-reported. It is fair to acknowledge that our current understanding of this topic is limited and that identification and proper validation of a diagnostic biomarker(s) for exacerbation is urgently needed. Using again the cardiology analogy, this would be equivalent to diagnosing or missing an acute myocardial infarction based on symptoms alone (without the aid of electrocardiography and biochemical changes). We used to do this once upon a time, but fortunately for patients with acute coronary artery disease, things have changed. Second, some, but not all, patients appear to be particularly prone to suffer repeated exacerbations, the so-called frequent exacerbators.8,14 Whether this represents true recurrence of exacerbations or, at least in some cases, treatment failure is difficult to dissect (Figure 1) 25 since exacerbations cluster and frequent exacerbators are more likely to have recurrent exacerbations. 26 Likewise, how much time must elapse between events to consider them as independent episodes is still debated 25,26 since it is necessary to know when the event starts and stops before a new event can be identified. It is plausible that different individual thresholds and/or degrees of social support (as discussed above) confound the rate of exacerbations reported by any single patient. Similarly, adherence to therapy is also likely to influence the frequency or persistence of exacerbations in COPD patients. Fourth, the symptoms of exacerbations include increased breathlessness, sputum volume, and sputum purulence as key features,32 but they do not always occur together and may develop at different times during the exacerbation. Other symptoms, such as cough, have been poorly studied during exacerbations and systemic features, such as lethargy and fatigue, are not routinely assessed. Finally, cardiovascular diseases are highly prevalent among patients with COPD.33 Recent research has begun to explore the possibility that occult cardiac disease may also play a role in the pathogenesis of COPD exacerbations. 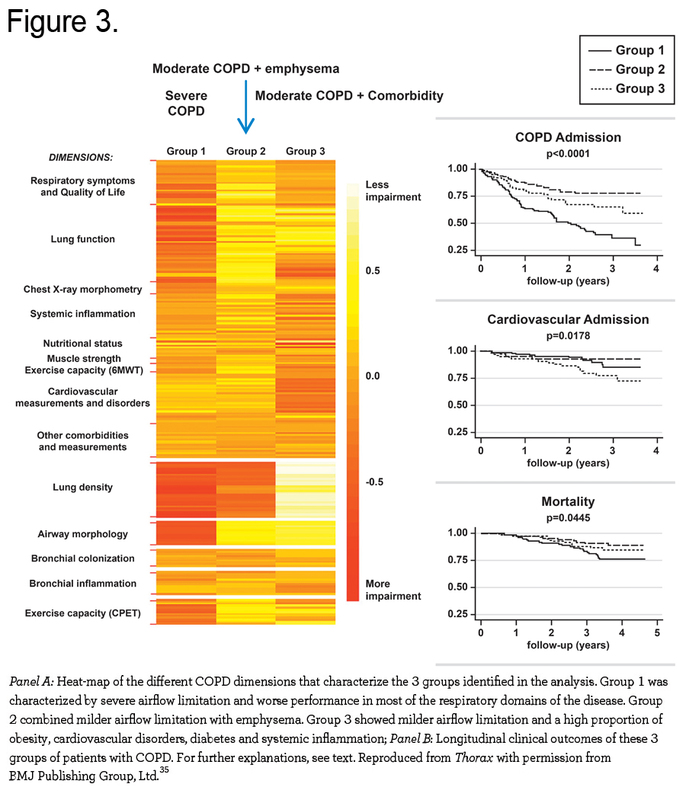 For instance, cardiac troponin has been shown to be frequently elevated in COPD exacerbations and is correlated with mortality among hospitalized patients.34 In this context, it is worth noting that Garcia-Aymerich et al 35 used cluster analysis in a cohort of 342 patients hospitalized for the first time because of a COPD exacerbation and identified 3 groups of patients with different clinical, functional, imaging, and, more importantly, outcomes during a 4-year follow-up: Group 1 (n=126, 37%) was labeled as severe respiratory COPD because they were characterized by severe airflow limitation (mean FEV1 38% predicted) and extensive emphysema on computed tomography (CT). Group 2 (n=125, 37%) was labeled as moderate respiratory COPD because they showed milder airflow limitation (mean FEV1 63% predicted), but had similar emphysema characteristics compared to Group 1. Group 3 (n=91, 27%) was labeled systemic COPD because they combined a milder airflow limitation (FEV1 58% predicted) with a high proportion of obesity, cardiovascular disorders, diabetes, and systemic inflammation, but no emphysema on CT. Importantly, during follow-up, Group 1 had more frequent hospitalizations due to COPD (hazard ratio [HR]=3.28, p<0.001) and higher all cause mortality (HR=2.36, p=0.018) than the other 2 groups, whereas Group 3 had more admissions due to cardiovascular disease (HR=2.87, p=0.014) (Figure 3). The results of this important study raise several important questions. First, how can it be that patients in Group 1 (with severe respiratory COPD) had not required hospitalization earlier during the course of their disease? Was it because they were poor perceivers, as discussed above, or just had no prior severe episodes? Second, these data provide clear evidence of heterogeneity among episodes of exacerbation and/or among individual patients suffering an exacerbation of COPD, as mentioned by the authors. Third, some exacerbations of COPD may actually represent exacerbation of symptoms in patients with COPD due to worsening of other less apparent, but frequent, comorbid diseases, such as heart failure.36 These questions deserve specific research if we are to understand, prevent, and treat these important events better and in a more effective manner. The risk of exacerbations varies greatly among patients. For instance, results from the Evaluation of COPD Longitudinally to Identify Predictive Surrogate Endpoints (ECLIPSE) study showed that of the 2138 patients studied, 24% did not experience exacerbations during the 3 years of follow-up, 47% experienced ≥1 exacerbation per year, and 29% experienced ≥2 exacerbations.8 However, these figures cannot be used as standards since there are several aspects that might have influenced them significantly. First, exacerbations were defined by a health care utilization definition and some may have been missed. Second, a period of stability was needed to be included in ECLIPSE and this may have reduced the number of frequent exacerbators recruited. Third, all patients included in ECLIPSE were treated by their local physician and this could have reduced the reported exacerbation frequency. Table 1 summarizes the evidence supporting a number of identified risk factors for exacerbations. These include: older age,37 presence of stable state symptoms (cough, sputum, and dyspnea),14,37-40 poor health status,14,40,41 severe airflow limitation,8,37,42 worse BMI-airway Obstruction-Dyspnea-Exercise capacity (BODE) Index score,43-45 presence of medical and psychiatric comorbidities, 37,46-50 persistent pulmonary, 51 and systemic inflammation,52 bacterial airway colonization,53 airway wall thickening demonstrated by computed tomography (CT),54 gastroesophageal reflux8 and pulmonary artery enlargement detected by CT.55 Finally, female gender has been noted to be associated with increased risk of exacerbations in several recent large clinical trials 56,57 although it is unclear whether this represents a difference in reporting or disease biology. Furthermore, it has been suggested that exacerbations beget exacerbations. A large study carried out by Suissa et al using a Canadian Pharmacy database that included 73,106 patients hospitalized for the first time for COPD and followed for up to 17 years showed that the risk of a subsequent severe exacerbation increased 3-fold after the second exacerbation requiring hospitalization, and 24-fold after the 10th exacerbation as compared to after the first hospitalization for an exacerbation (Figure 4). 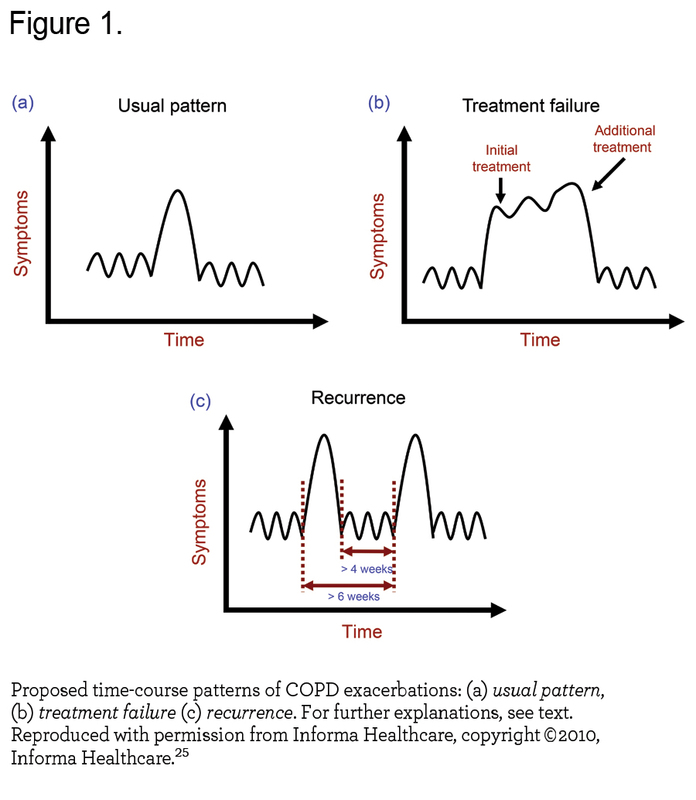 From these observations, Suissa et alsuggested that the course of COPD has 2 phases after the first hospitalized exacerbation. The first is a less than 2-year period of stable risk until the second hospitalized exacerbation or death. After the second hospitalized exacerbation, severe exacerbations recur progressively sooner after each subsequent severe exacerbation and the mortality rate rises with every new exacerbation. Thus, there is a window of opportunity during the stable phase after the first hospitalization to intervene and potentially prevent a subsequent severe exacerbation.58 In keeping with this view, it is now recognized that COPD exacerbations cluster and that having an event makes a patient more susceptible to another event within an 8-week period.26 Patients who are frequent exacerbators are also more likely to have a history of recurrent events. 26 However, when the gap between episodes is long, the progression of COPD itself may sensitize the patient to episodes that would have appeared minor earlier in the disease. 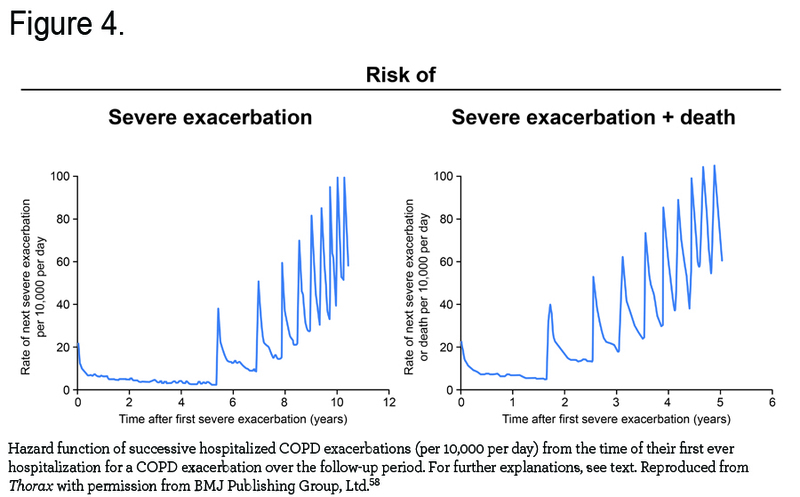 In any case, recurrent hospitalization for exacerbations is a common and serious problem in COPD 59,60 and reducing the risk for exacerbation-associated rehospitalization is thus an important treatment goal. Decreasing or, ideally, abolishing exacerbations is an important goal in COPD.61 Over the past 2 decades, several new approaches to exacerbation risk reduction have emerged. 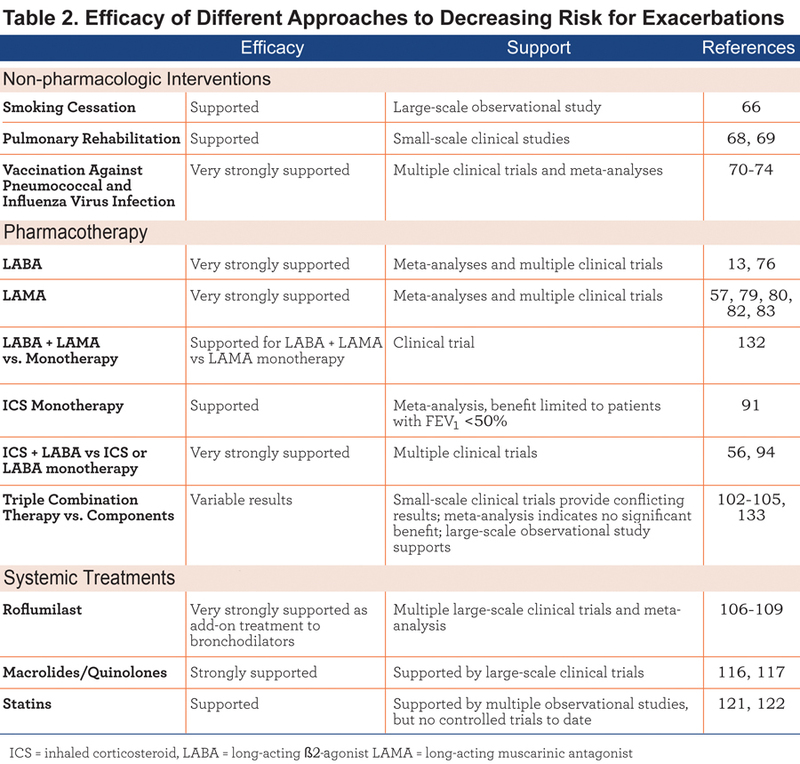 Table 2 summarizes the efficacy of different therapeutic options in decreasing COPD exacerbations and the following sections discuss these options in detail. However, 3 notes of caution are worth emphasizing in order to interpret published findings. First, when considering the clinical trials and meta-analyses described in the following sections, it is important to emphasize that a number of factors can influence results reported, including definition and recording of exacerbations, the baseline exacerbation rate for the patient, and study duration. Thus, while comparisons of different interventions within a given well-controlled trial provide useful information about relative efficacy of treatments, use of results from different studies to compare treatments should be viewed with caution. Meta-analysis of results from 9 relatively small trials that included 432 patients indicated that pulmonary rehabilitation significantly decreased future hospital admissions (p<0.05).68 Results from an additional controlled trial of 60 patients admitted to the hospital for an exacerbation also indicated that post-discharge pulmonary rehabilitation significantly decreased the risk for subsequent exacerbations (p=0.02).69 These benefits may reflect a resetting of the symptom threshold and/or the improvement of the general physical condition of the patient. Results from several studies and meta-analyses have demonstrated that vaccination against influenza virus (and possibly pneumococcocus) decreases the risk for exacerbation in patients with COPD.70-74 presumably by enhancing the immunity against such organisms. In summary, available evidence clearly indicates that long-acting bronchodilators significantly reduce the occurrence of exacerbations in patients with COPD. This may represent the improvements in baseline lung function thereby resetting the symptom threshold or the prevention of episodes in which acute bronchoconstriction plays a role. An important question that remains to be definitively answered is whether the combination of a LABA and a LAMA is significantly superior to monotherapy in decreasing exacerbations. Recent results have indeed indicated that a LABA-LAMA combination was significantly superior to LAMA alone in decreasing the rate of moderate to severe exacerbations.84 However, it should be noted that results reflect group data and it remains unclear whether the effects of LABA plus LAMA are additive in a given patient or reflect benefit to different individuals or even episodes with different characteristics. Finally, the effects of methylxanthines in preventing exacerbations are unclear, since according to the GOLD recommendations, treatment with theophylline is not recommended unless other long-term treatment bronchodilators are unavailable or unaffordable.1 Yet, there is some evidence that these agents may enhance the anti-inflammatory effects of steroid treatment during exacerbations.85 Their potential role when combined with inhaled steroid treatment in preventing COPD exacerbations merits further research. There is clear evidence that the combination of LABA with ICS is superior to LABA alone in decreasing exacerbations. The Towards a Revolution in COPD Health (TORCH) study was a randomized, double-blind trial that compared salmeterol (50 μg) plus fluticasone propionate (500 μg) versus placebo, salmeterol alone, or fluticasone propionate alone for a period of 3 years in 6112 patients with COPD and FEV1 <60% predicted. Study results showed that the combination regimen was significantly superior to placebo (p<0.001), fluticasone (p=0.02), and salmeterol (p=0.002) for decreasing the rate of exacerbations requiring treatment with antibiotics, systemic corticosteroids, or a combination of these interventions (p<0.001, p=0.02, and p<0.001, respectively). Of interest, combination therapy was significantly superior to placebo and ICS alone, but not to salmeterol, for decreasing the rate of exacerbations requiring hospitalization.56 Recent data have confirmed that exacerbation prevention is enhanced by adding ICS to a LABA even when these drugs are given once daily and in the absence of any apparent effect on lung function, at least in one of the trials reported.93 However, patients receiving fluticasone (alone or in combination with salmeterol) had an increased risk of pneumonia. The effects of ICS plus a LAMA (tiotropium) have been evaluated for outcomes, including pulmonary function, symptoms, and health-related quality of life,100,101 but there is no published information regarding the benefit of this combination versus LAMA monotherapy for decreasing exacerbations. However, the Prevention of Exacerbations with Tiotropium in COPD (POET-COPD) study showed that once-daily treatment with tiotropium was more effective than twice-daily salmeterol (with or without ICS) in preventing exacerbations 80 suggesting ICS may provide little additional benefit to LAMA. Studies that have assessed the effects of LABA plus ICS plus tiotropium on the risk of future exacerbations have produced mixed results. Those showing evidence in favor of the use of triple therapy include the following: (1) A study of 126 patients showed that the combination of tiotropium plus salmeterol/fluticasone resulted in significantly fewer exacerbations than either tiotropium or salmeterol/fluticasone over 12 months of follow-up (p<0.01).102 (2) A 12-week, randomized, double-blind, parallel-group, multicenter study that included 660 patients who received tiotropium plus either budesonide/formoterol or placebo twice daily, showed that triple therapy significantly decreased the risk for severe exacerbations (p<0.001) and the frequency of hospitalizations and emergency department visits (p=0.011) versus tiotropium alone.103 This latter study, however, lasted only 12 weeks, so results should be viewed with caution since it has been recommended that studies investigating COPD exacerbations should have a duration of at least 12 months because of seasonal variation in exacerbation frequency.63 (3) A recent observational study that included results from 3333 Medicare enrollees also showed that triple therapy with fluticasone, tiotropium, and salmeterol was significantly superior to tiotropium alone in reducing the risk for moderate exacerbations (HR=0.772, 95% CI=0.641-0.930) and any exacerbation (HR=0.763, 95% CI=0.646-0.949). However it should be noted that all of these studies assume that double combination is superior to monotherapy. Several post-hoc analyses provided further relevant clinical information: (1) The effect of roflumilast persisted even in the presence of concomitant treatment with ICS.109 (2) As reported in abstract form, roflumilast significantly decreased hospitalization due to severe exacerbations110 and that of moderate-to-severe exacerbations when added to tiotropium in highly symptomatic patients (modified MRC scale score ³2 at baseline).111 (3) Among frequent exacerbators treated with roflumilast, 32.0% still had frequent exacerbations after 1 year of treatment, as compared to 40.8% of placebo-treated patients (p=0.0148). 112 Conversely, 17.5% of infrequent exacerbators treated with roflumilast became frequent exacerbators at year 1, versus 22.9% of those taking placebo (p=0.0018).112 The beneficial effects of roflumilast were seen most clearly in COPD patients with the chronic bronchitis phenotype, suggesting that this is an important clinical biomarker for a responder group. Of note, a proportion of patients had to discontinue roflumilast mostly because of adverse gastrointestinal effects. Since bacterial airway colonization with potentially pathogenic organisms can occur in COPD,113 and this seems to relate to exacerbation risk, 53,114 several studies have explored whether chronic antibiotic treatment can decrease exacerbation frequency. A study in 109 COPD outpatients showed that administration of erythromycin 250 mg twice daily significantly decreased the frequency and duration of exacerbations over 1 year (p=0.003).115 Similarly, a 1-year study of 1142 COPD patients who received azithromycin at a dose of 250 mg/day or placebo indicated that active treatment significantly decreased exacerbation frequency (p=0.01). 116 It remains uncertain whether the benefit reflects the antimicrobial or anti-inflammatory properties of macrolides. Further, development of antibiotic resistance is also a potential complication of long-term macrolide treatment. In the study carried out by Albert et al,116 cultures for susceptibility testing were available from 68% of the participants in the azithromycin group and 70% in the placebo group who were not colonized with selected respiratory pathogens at the time of enrollment but who became colonized during the course of the study (p=0.76). In these patients, the incidences of resistance to macrolides were 81% and 41%, respectively (p<0.001). Finally, this study also showed that audiogram-confirmed hearing deficits occurred significantly more often with azithromycin than placebo in these patients (p=0.04) 116 suggesting such an approach should be considered with caution. A study of 1157 COPD patients who received moxifloxacin or placebo once daily for 5 days, every 8 weeks, for a total of 6 cycles showed that antibiotic administration significantly decreased exacerbations in the per-protocol population (p=0.046), but not in the intent-to-treat population (p=0.059).117 Furthermore, administration of a single course of moxifloxacin treatment aimed at eradication of bronchial colonization did not significantly decrease exacerbations in a cohort of 119 stable patients with COPD.118 Thus, benefits of quinolones have not been proven although this may reflect failure to enrich the study population for patients colonized with bacteria and exacerbations thought to be of bacterial origin. Statins inhibit the enzyme HMG-CoA reductase and are used in clinical practice to treat hypercholesterol emia. Statins also have significant anti-inflammatory effects, and epidemiologic studies have shown that administration of statins is associated with significantly decreased all-cause mortality in COPD patients. 119,120 A retrospective study of 185 patients indicated those receiving statins had a significantly lower frequency of exacerbations than those who did not (p<0.0001), 121 but such effects have not been evaluated in a prospective controlled trial. Likewise, a study that used the Taiwan National Health Insurance database and included 6252 patients with COPD also indicated that statin use significantly decreased the risk for exacerbations requiring hospitalization.122 However, it remains unknown whether these episodes reflect reduction in exacerbations of a cardiac nature. It is unclear if treatment with β-blockers decreases mortality in patients with exacerbations. On the one hand, results from 825 COPD patients admitted to the hospital with an exacerbation indicated that β-blocker use was associated with reduced mortality (OR=0.39, 95% CI=0.14-0.99).123 On the other, however, a prospective national study of 2249 patients starting long-term oxygen therapy for COPD in Sweden indicated increased mortality for those receiving β-blockers (HR=1.19, 95% CI=1.04-1.37, p=0.010).124 Thus, the benefits/harm may be patient phenotype dependent. Since COPD is associated with significant oxidative stress, the use of antioxidant agents have also been tested in these patients.125 Results, however, have been negative126 or arguably reflect a number of methodological flaws 127 at prevention of exacerbations in patients with COPD. The studies reviewed above reveal a number of important knowns and unknowns related to COPD exacerbations. Given the importance of exacerbations in the natural history of the disease, the episodes are clear targets for future research. Among current knowns we would include: (1) the realization of the important impact that exacerbations have upon the natural course of the disease and the prognosis and well-being of COPD patients, (2) that multiple risk factors for exacerbations have been established; and (3) thatresults from multiple clinical trials have shown that currently available treatments for COPD can decrease, but not abolish exacerbations. On the other hand, among current unknowns we would highlight as particularly relevant are the following: (1) Since COPD exacerbations are heterogeneous24,31 there is much more to be learned about the nature of these events and how they differ across the spectrum of patients with this disease (e.g., those with mild versus more severe COPD and those with different comorbidities). Objective outcome measures for detection and assessing severity of exacerbations are required, especially for clinical trials. EXACT is a novel instrument for the study of exacerbations. Available data suggests that when EXACT is used for detection of exacerbations, the relationship between these events and standard health care utilization is not very strong. However, EXACT is a good tool for the assessment of exacerbation severity and recovery.128 (2) We need to identify and validate reliable biomarker(s), both biochemical, clinical and physiological, to diagnose exacerbations precisely, differentiate among different types of exacerbations, guide preventive therapy, and establish the prognosis. (3) We need a defined approach for targeting therapies to prevent exacerbations based on their characteristics in a given patient and in different subgroups (i.e., phenotypes) of COPD, since effects of medication on exacerbation rate in different phenotypes have so far been disappointing. For instance, it was not possible to show that roflumilast had a greater effect on exacerbation rate in frequent exacerbators112 suggesting similar variability of episodes in both frequent and infrequent exacerbators. Similarly, the effects of salmeterol/fluticasone or tiotropium on exacerbation rates were similar in GOLD stages II, III and IV. (4) We need to understand the influence of comorbidities on the risk for and nature of exacerbations since improved management of these conditions decrease exacerbation risk. For instance, results from 1 study showed that in patients with both obstructive sleep apnea (OSA) and COPD (termed an overlap syndrome), treatment with continuous positive airway pressure (a standard therapy for OSA) decreased the risk for exacerbations requiring hospitalization.129 Much more research is therefore needed to determine whether better management of common COPD comorbidities, such as cardiovascular disease, can decrease the risk for exacerbations. (5) We need to understand whether persistent systemic inflammation is a cause or effect of increasing exacerbation risk .52 The effects of available anti-inflammatory therapies (ICS, roflumilast, statins, other) in this particular subgroup of patients deserve further study. (6) We need to understand why we are not able to completely prevent exacerbations, even when all available drugs are used in combination. This suggests that we are not targeting some unknown but important mechanism(s). (7) In addition to treatments designed to prevent exacerbations, the management of the acute episodes clearly needs improvement, since a significant proportion of patients require early hospital readmission and post exacerbation mortality is high. This manuscript is the result of discussions at the Expert Leadership of COPDforum, a Takeda initiative that took place September 28, 2012, in Amsterdam, the Netherlands. The content of the manuscript was developed solely by the authors. The authors wish to acknowledge the medical writing and editorial support of Robert Rhoades, PhD, BoomCom, Inc., funded by Takeda. Takeda was given the opportunity to review the final version of the manuscript for accuracy of the data. However, consideration of any review comments remained at the full discretion of the authors. 15. Anzueto A, Leimer I, Kesten S. Impact of frequency of COPD exacerbations on pulmonary function, health status and clinical outcomes. Int J Chron Obstruct Pulmon Dis. 2009;4:245-251. 16. Global initiative for chronic Obstructive Lung Disease.2011 Global strategy for the diagnosis, management, and prevention of chronic obstructive lung disease. GOLD Website. http://www.goldcopd.org/guidelines-global-strategy-for-diagnosis-management.html. Published 2011.Last accessed on March 23, 2013. 44. Hodgev VA, Kostianev SS, Marinov BA. Correlation of frequency of exacerbations with the BODE index in COPD patients. Folia Med (Plovdiv). 2006;48(2):18-22. 68. Puhan MA, Gimeno-Santos E, Scharplatz M, Troosters T,Walters EH, Steurer J. Pulmonary rehabilitation following exacerbations of chronic obstructive pulmonary disease. Cochrane Database Syst Rev. 2011;(10). 71. Poole PJ, Chacko E, Wood-Baker RW, Cates CJ. 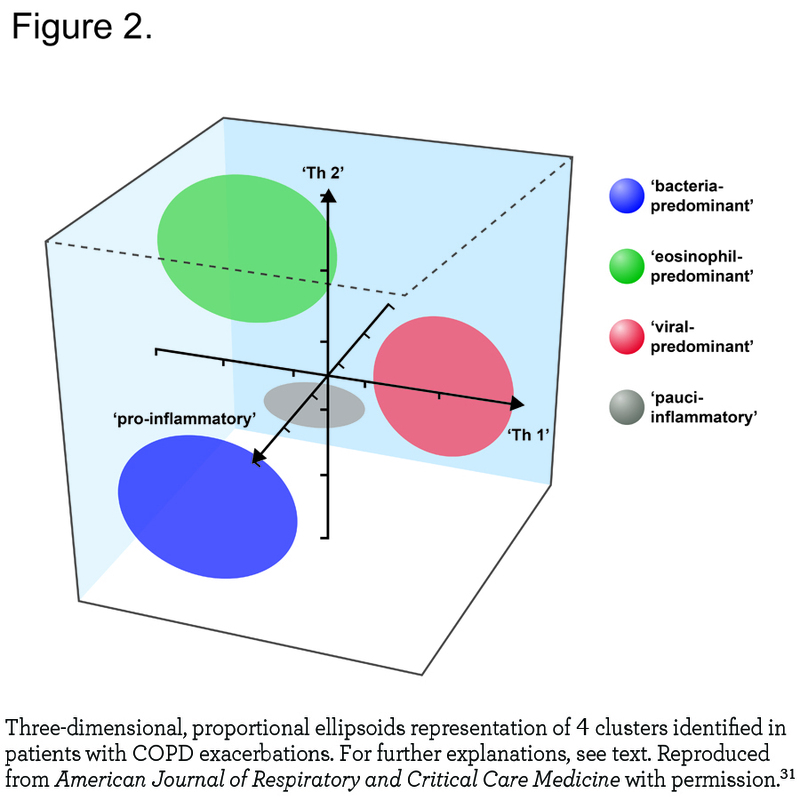 Influenza vaccine for patients with chronic obstructive pulmonary disease. Cochrane Database Syst Rev. 2000;(4). 74. Poole PJ, Chacko E, Wood-Baker RW, Cates CJ. Influenza vaccine for patients with chronic obstructive pulmonary disease. Cochrane Database Syst Rev. 2006;(1). 78. Celli BR. [What is the best pharmacological treatment to prevent exacerbation of chronic obstructive pulmonary disease?] (article in Polish). Pol Arch Med Wewn. 2008;118:172-174. 79. Van den Bruel A, Gailly J, Neyt M. Does tiotropium lower exacerbation and hospitalization frequency in COPD patients: results of a meta-analysis. BMC Pulm Med. 2010;10:50. 92. Global initiative for chronic Obstructive Lung Disease.2014 Global Strategy for the Diagnosis, Management, and Prevention of Chronic Obstructive Pulmonary Disease. GOLD Website. http://www.goldcopd.org. Published January 2014. Accessed September 8, 2014. 99. Janson C, Larsson K, Lisspers KH, et al. Pneumonia and pneumonia related mortality in patients with COPD treated with fixed combinations of inhaled corticosteroid and long acting β2 agonist: observational matched cohort study (PATHOS). BMJ. 2013;346. 102. Fang LZ, Liang X, Zhang JQ, Liu L, Fu WP, Zhao ZH, Dai LM. [Combination of inhaled salmeterol/fluticasone and tiotropium in the treatment of chronic obstructive pulmonary disease: a randomised controlled trial] (article inChinese). Zhonghua Jie He He Hu Xi Za Zhi. 2008; 31(11):811-814. 110. Bateman E, Jardim J, Goehring UM, Brose M, Calverley P. Effect of roflumilast on hospitalizations in COPD patients. Eur Respir J. 2012;40(Suppl 56):P2109. 111. Fabbri L, Goehring UM, Brose M, Rabe K. Effects of roflumailast in highly symptomatic COPD patients. Eur Respir J. 2012; 40(Suppl 56): P742. 132. National Institutes of Health. Effect of QVA149 versus NVA237 and tiotropium on chronic obstructive pulmonary disorder (COPD) exacerbations (SPARK). NCT01120691. clinicaltrials.gov Web site. http://www.clinicaltrials.gov/ct2/show/NCT01120691?term=NCT01120691.&rank=1. Published 2010. Updated 2013.Accessed September 8, 2014.